The Tea Project is an ongoing dialogue that traverses a variety of landscapes. From the tea sipped at a family gathering, to a cage in Guantanamo Bay, to a motor pool in Iraq, tea is not only a favored drink but a shared moment that transcends cultural divides and systems of oppression. When someone sits, sips, and reflects over a cup of tea there is space to ask questions about one’s relationship to the world: a world that is filled with dehumanization, war, and destruction; a world that is filled with moments of beauty, love, and humanity. Above Image: "Tea Performance MoMA NYC." Photograph by Beatriz Meseguer. The missions would roll to a halt. The day would end. The sun would set. In the motor pool where we all slept, the third country nationals would roll out a rug, pull out a hot plate, and warm water to make tea. Above Image: "Third Country Nationals in Iraq" 2003. Photograph by Aaron Hughes. Would you like to know some trivia? That is how all of this started. The photographs. The tea. An old woman turns to me on the bus and asks, would you like to know some trivia? So I said, Of course I would like to know some trivia. Well, she said, when I was a young girl… Do you know the stables back that way? Yes of course they give pony rides for children on Sundays. Well when I was a young girl in high school, my girlfriends and I would go horseback riding from that stable. And, do you know the buildings that are back up in the forest preserve that way? No. I did not know there were buildings in the forest preserve. Yes, well when I was a young girl it was a POW camp and there were all these young beautiful German boys in the camp. It was a work camp and so they were strong and handsome. And, well, my girlfriends and I would ride our horses over to the camp and blow them kisses. Why did she tell me this story… this bit of trivia? Actually, that’s what started all of this. I can’t understand why she told me this story. Was it just chance? Did I remind her of something? Did she somehow know? Did I remind her of a German prisoner of war? A German soldier? Do I remind you of a German soldier? Above Image: "World War Two German POWs in the United States" Photograph source unknown. I did research on those camps. Turns out there were over 600 POW camps in the States. Most were work camps filled with German and Italian prisoners. The one down the road from my mom’s house was called Skokie Valley POW Camp. The prisoners would farm and work in the orchards that used to be around here. They even built a chapel on the old Glenview Naval Air Base near where I grew up. One of the books I read was called “We Were Each Other’s Prisoners” and told the story of a prisoner in a Michigan camp who fell in love with an American girl. They even got married after the war. How to Become a Concentration Camp Guard Without Even Trying… that’s what Chris said about it all. I know Chris liked working night shifts, because whenever they were awake, he wanted to apologize to them. When they were sleeping, He didn’t have to worry about it. He could just walk up and down the blocks all night long. He fell in love… He missed the cups. Above Image: "Guantanamo Bay Detainees" Photograph source unknown. One thing I miss is the cups. The detainees were only allowed to have Styrofoam cups, and they would write and draw all over them. I’m not totally familiar with Muslim culture, but I did learn that they don’t draw the human form, and I’m not positive if they draw any creatures, but they draw a lot of flowers. They would cover the things with flowers. Then we would have to take them. It was a ridiculous process. We would take the cups—as if they were writing some kind of secret message that they were somehow going to throw into the ocean, that would get back to somebody—and send them to our military intelligence. They would just look at these things and then throw them away. I used to love those little cups.—Former Guantanamo Bay Detention Camp guard, Chris Arendt in Lily Pierce’s “What It Feels Like...to Be a Prison Guard at Guantánamo Bay.” Esquire Magazine, July 30, 2008. Regardless, I know I would like to have Arabic tea in one of those cups along the river—whether it is the north branch of the Chicago or the Euphrates where I dreamed of how connected it all is; the Euphrates to the gulf to the oceans to the rivers to home. Above Image: “Chris Arendt & Former Detainee Jarallah Al-Marri: Jarallah Al-Marri picked up the little styrofoam cup on the table and nudged Chris. “Look, look!” he said and Chris laughed—it was identical to the ones from Guantanamo.” Photograph by Sarah Mirk Guantanamo Voices, "Styrofoam Flowers," January 16, 2009. Inspired by Chris Arendt’s account and others’ stories of the detained men in the Guantanamo Bay Detention Camp drawing flowers on Styrofoam cups, Amber Ginsburg and Aaron Hughes endeavored to create 779 porcelain cast Styrofoam teacups, one for each individual detained. Each teacup is detailed with the name of one of the 779 individuals along with their country of citizenship. These cups are decorated with a floral design based on the national or native flowers from the detainee’s country of citizenship. There are forty-nine countries that have or had a citizen detained in Guantanamo. In each country’s floral design, the number of flowers represents the number of citizens detained from the respective country. The cups are a lasting collection of artifacts reflecting global conflict while also being individual vessels that are easily lifted out of display and into your hands for a cup of tea. According to all accounts, the original cups from Guantanamo were destroyed. Aaron Hughes submitted a Freedom of Information Act request to the Department of Defense to inquire about any documentation of these cups with no response. Amber Ginsburg and Aaron Hughes ultimately plan to connect with arts and community organizations in countries with citizens that are or were detained in Guantanamo. 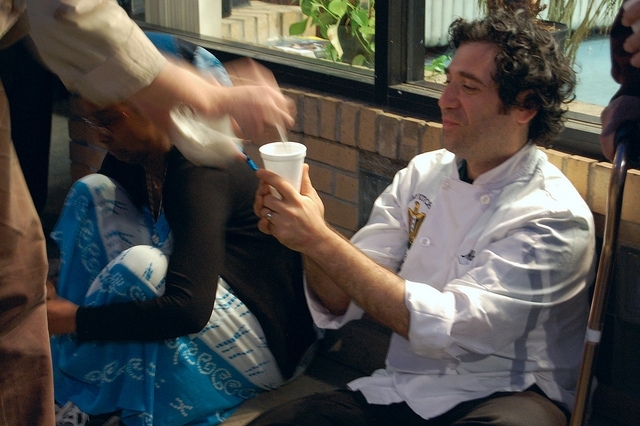 In these countries they hope to host tea, share stories, and distribute the cups as gifts. 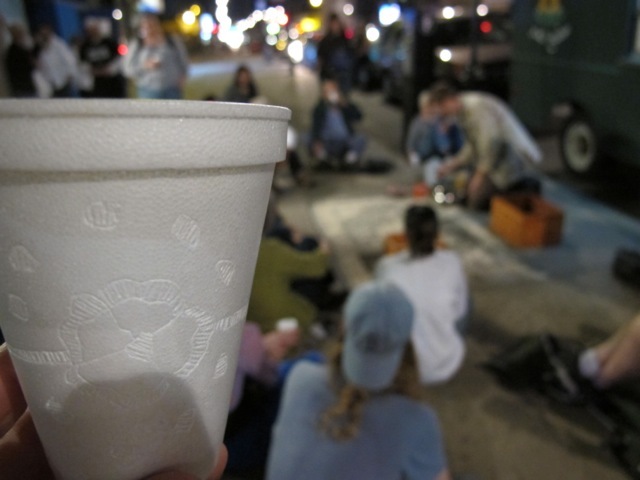 Above Images: "During a 2014 Lawrence Arts Center Project Based Artist in Residency Aaron and Amber along with many incredible volunteers opened a cup factory to produce 779 porcelain styrofoam cups." Photographs by Marlo Angle. A performance and discussion that explores war, detention, love, and tea. Tea Performances utilize the space created when someone sits, sips, and reflects over a cup of tea to ask questions about one’s relationship to the world: a world that’s filled with dehumanization, war, and destruction; a world that’s filled with moments of beauty, love, and humanity. Kala Art Institute, Berkeley, CA. 2018. Museum of Contemporary Art Chicago, Chicago, IL, 2017. Expergiscimini: Waking Up, Idyllwild Arts Academy, Idyllwild, CA, 2017. EXPO CHICAGO in conjunction with Human Wrights Watch, Chicago, IL, 2017. Weinberg/Newton Gallery, Chicago, IL, 2017. Material Histories: Cultures of Resistance, Ohio University School of Art & Design, Athens, OH, and the Majestic Gallery, Nelsonville, OH, 2017. University of Texas San Antonio, TX, 2017. Not Alone, San Francisco Arts Commission, San Francisco, CA, 2017. The Dirty Canteen: Contemporary Art Made by Veterans, College of the Redwoods, Eureka, CA, 2016. Forgotten Wars & Flowers, University of Wisconsin Parkside, Kenosha, WI, 2016. Iowa Tea Tour, Islamic Center of the Quad Cities, Mother Mosque of America, & PEACE Iowa, 2016. Arts Circle Celebration, Northwestern University, Evanston, IL, 2016. Links Hall, Chicago, IL, 2016. Art & Other Tactics, San Francisco Museum of Craft and Design, San Francisco, CA, 2016. Tea & Darkness, Clearing Barrel, Kaiserslautern, Germany, 2015. Tea & Darkness, NWE Vorst Theater, Tilburg, Holland, 2015. Tea & Darkness, Haus der Kulturen der Welt, Berlin, Germany, 2015. Tea & Darkness, BAIZ, Berlin, Germany, 2015. Karşı Sanat, Istanbul, Turkey, 2015. Border Free Community Center, Afghan Peace Volunteers, Kabul, Afghanistan, 2015. Artist Experiment, Museum of Modern Art, New York, NY, 2015. Ceramic Research Center, Arizona State University Art Museum, Tempe, AZ, 2015. The Uncertainty of a Life in Security, University of Texas San Antonio, TX, 2015. IVAW Convention, Ocoee, TN, 2015. Art & Other Tactics, Craft and Folk Art Museum, Los Angeles, CA, 2015. The Imaginists, Santa Rosa, CA, 2015. A Lived Practice, Sullivan Gallery, School of the Art Institute of Chicago, Chicago, IL, 2014. Lawrence Arts Center, Lawrence, KS, 2014. Reconnaissance, Headlands Center for the Arts, Fort Barry, CA, 2014. Performing Tableware, University of Chicago, Chicago, IL, 2013. Open Engagement, Portland, OR, 2013. Ashkal Alwan: The Lebanese Association for Plastic Arts, Beirut, Lebanon, 2013. Maruki Gallery, Tokyo, Japan, 2012. Milo's Palace, (In conjunction with Feast & Enemy Kitchen at the Smart Museum), Chicago, IL, 2012. Lycoming College Art Gallery, Lycoming, PA, 2010. MFA Thesis Show, Block Museum, Evanston, IL, 2009. 2,191 Days and Counting, Powerhouse Arena, Brooklyn, NY, 2009. Turning Tales, Kala Art Institute, Berkeley, CA. 2018. EXPO CHICAGO in conjunction with Human Rights Watch, Chicago, IL, 2017. E Pluribus: Reflections on the Anniversary of 9/11, Center for the Visual Arts Gallery, Kent State University, Kent, OH, 2017. Tea Project with Ghaleb Al-Bihani & Djamel Ameziane, George Washington University, Corcoran Gallery, Washington, DC, 2017. E Pluribus: Reflections on the Anniversary of 9/11, Silent Funny, Chicago, IL, 2016. E Pluribus: Reflections on the Fifteenth Anniversary of 9/11, UNUM, Chicago, IL, 2016. Art & Other Tactics, Museum of Craft & Design, San Francisco, CA, 2016. Tea Project, Links Hall, Chicago, IL, 2016. Emergency/Emergence: Art After War, Merced County Arts Council in conjunction with the University of California, Merced, CA, 2015. Converse, Indiana University Northwest, Gary, IN, 2014. Tea Project, Lawrence Arts Center, Lawrence, KS, 2014. Tea: History and Vulnerability, Lycoming College Art Gallery, Lycoming, PA, 2010. Block Museum, Evanston, IL, 2009.